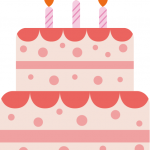 Happy 7 months to the iCarol Ideas Portal! The iCarol Ideas Portal was released about 7 months ago, and already it is having a big impact, just as we hoped it would. We want to thank you all again for embracing the iCarol Ideas Portal as you have, and contributing so many wonderful ideas to it. By participating on the portal and casting your vote on the ideas that would be most beneficial to you and your organization, you help our Product Management team prioritize what we work on next, and enhance the iCarol experience for everyone. Keep those ideas coming! One thing that makes iCarol software so especially suited for not-for-profit helplines of all types is that it was created from the direct experience of helpline volunteers, and continuously grows by incorporating the great ideas from our users and from industry experts. In fact, a bunch of the features and enhancements you enjoy today started out as an idea from someone who uses iCarol at their helpline. While we work on new big features and changes with our planned roadmap, we also use a community development approach for custom projects which enhances iCarol for all subscribers. All of this amounts to creating a robust and comprehensive all-in-one software solution that is invaluable for helpline staff and volunteers in their daily work. That last capability will surely add some fun and interactivity to the portal, while also giving us helpful feedback towards prioritization by seeing which ideas are the most popular and meaningful to our clients. Each user will get 10 votes to apply to the ideas they like, and you can apply up to 5 votes to a single idea you really love. 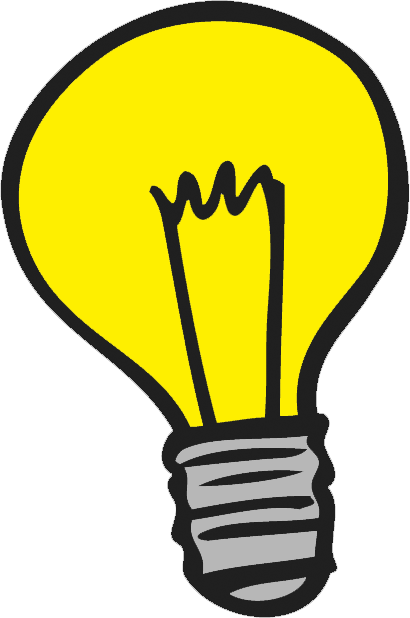 Ideas can also be retracted and added back to your bank of votes. This may be useful in times where you are out of votes but see a new idea you like more than one you’ve previously voted for. When an idea is released to iCarol, or if we move an idea to not likely to implement, all votes for that idea are returned to you. You’ll find the iCarol Ideas Portal by navigating to the Help section of your iCarol system. We’ve also included a number of Help Articles that outline how to use the portal to browse ideas, vote on enhancements, add comments to existing ideas, or add your own idea for consideration. It’s our hope that the new iCarol Ideas Portal will improve communication and help you share your great ideas for iCarol with us. We’re excited to open this new communication channel with the aim of continuing to enhance iCarol and have it reflect the many fantastic ideas from which all our users, and their communities, can benefit. One of iCarol’s most versatile features, Online Forms, enables visitors to your website to enter information that, when submitted, becomes a completed call form in your iCarol system. While there are several use cases for iCarol’s Online Forms, one major focus of these forms is in enabling a true continuity of care between the initial service providers (e.g. hospitals, clinics, physicians) and the helpline service following up with the patient following discharge. Health advocates agree, one of the biggest issues they face relates to following up with patients after they have been discharged. Many hospital systems lack the time, resources, and specialized knowledge to provide a comprehensive continuity of care and as a result are looking to helplines, warmlines, and information and referral services to provide follow-up to their recently discharged patients. With iCarol’s Online Forms, hospital staff can enter patient information through a website, either yours or theirs, and the submitted information comes into your iCarol system as a completed call form. Once submitted, other actions can occur, including follow-up scheduled automatically and an email sent to one or more of your helpline staff. Then, your staff can use iCarol to contact the patient through a phone call or even a text message. Best of all, the data related to the initial form submission and all subsequent contact with the patient is all kept and reportable through the iCarol Statistics, allowing you to keep track of how many patients you’re receiving, why patients require a follow up from your helpline, and what happened when your staff followed-up with the patients. We are acquainted with privacy laws like HIPAA (US), PIPEDA (Canada) and the Data Protection Act (UK and Europe). We have safeguards and processes so that we do our part to maintain compliance with these laws, and are willing to sign needed agreements asserting our role in your compliance with them. For more information about iCarol’s security settings and standards, download the iCarol Security Summary. As more hospitals and physicians look to enhance the continuity of care for their discharged patients, helplines, warmlines, and information and referral services are uniquely positioned to fill this service gap for health providers and using Online Forms may just be the missing link that can help you fill this need. iCarol is a large and complex piece of software, and every client uses it a little differently. Some clients use some features, and other clients use other features. Client needs also change over time, necessitating the discontinuation, addition or adjustment of processes and policies. We understand that there is turnover in our client agencies, so training new staff or volunteers is a continuous need. We are here to help! 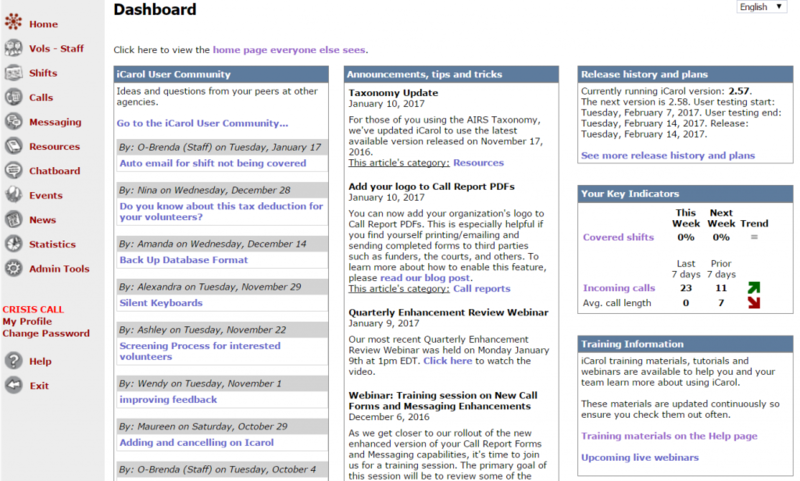 We have a number of self-serve options for training and notification of new features and enhancements. We encourage all of our clients to explore the information available through these options to assist you with building and maintaining your knowledge of how to use iCarol to meet your needs. 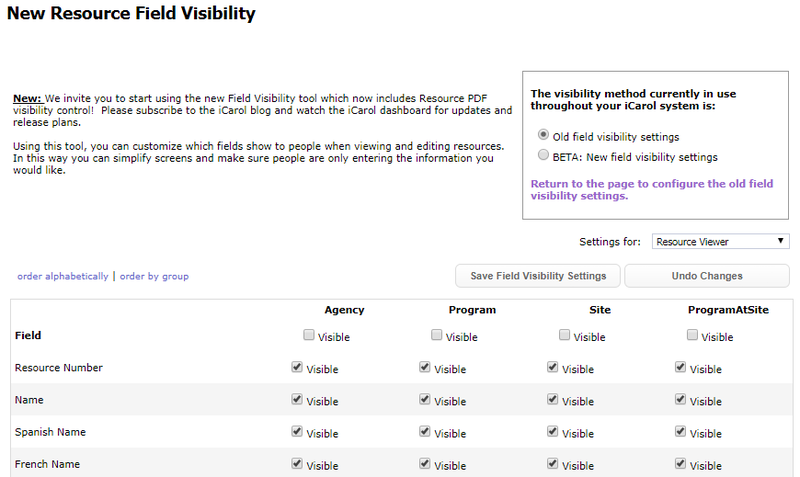 To access the Help page, simply click Help in the left hand menu when you are logged into iCarol. 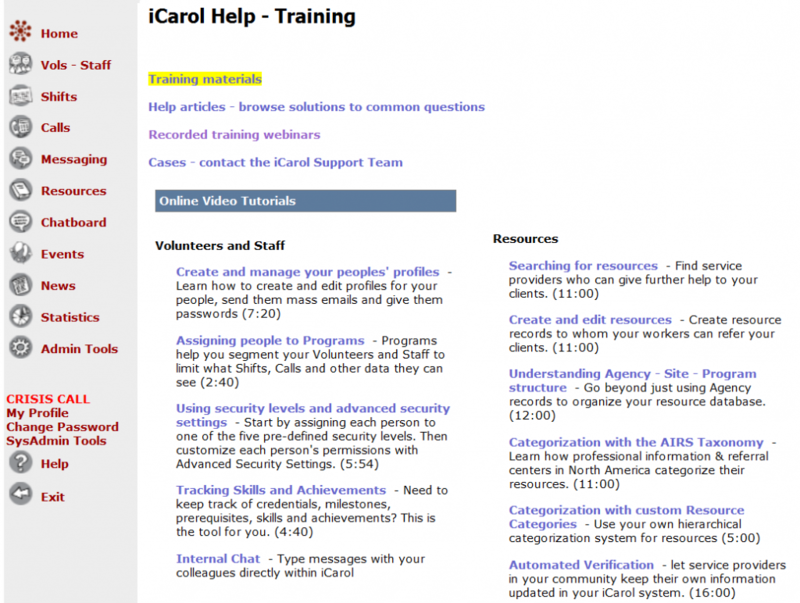 The Help Page is organized into sections representing the major features of iCarol – Volunteers and Staff, Shift Calendar, Call Reports, Messaging, Resources, and Statistics and Reporting. Each section has a number of videos or other documents (for example, PowerPoint presentations) explaining how to use the different features in iCarol. Feel free to use any of these materials in your own training programs at your agency. 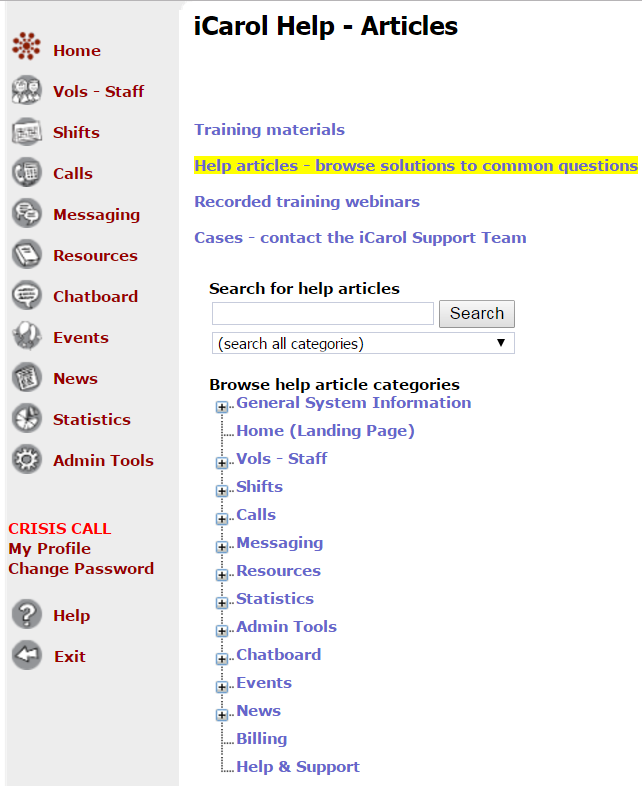 To access iCarol Help Articles, click Help form the left hand menu when you are logged into iCarol, then, at the top of the page, click “Help articles – browse solutions to common questions”. 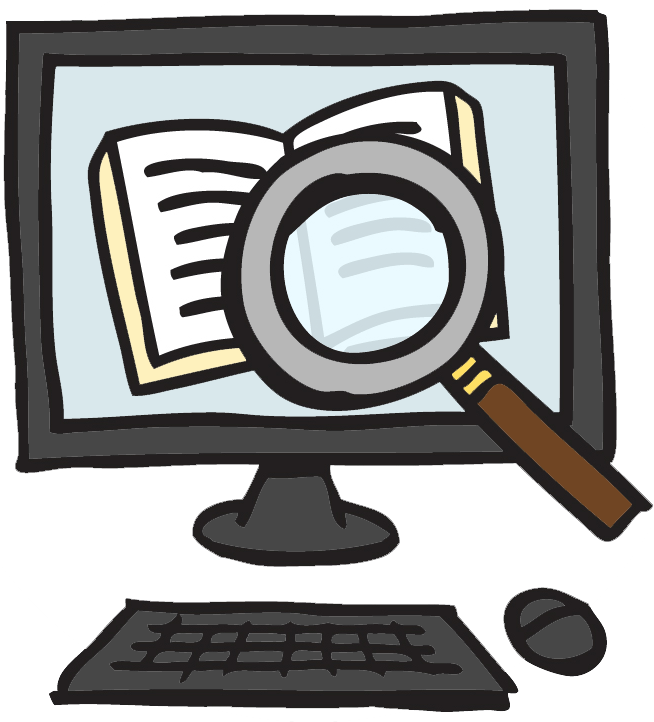 You can search for help articles in a few different ways. You can enter a word or phrase in the text box next to the Search button, and then click the Search button. You can refine this search to a particular category by choosing a category from the drop-down menu below the search text box. Or, you can browse through the various categories and sub-categories listed on the screen by clicking on the name of a category. 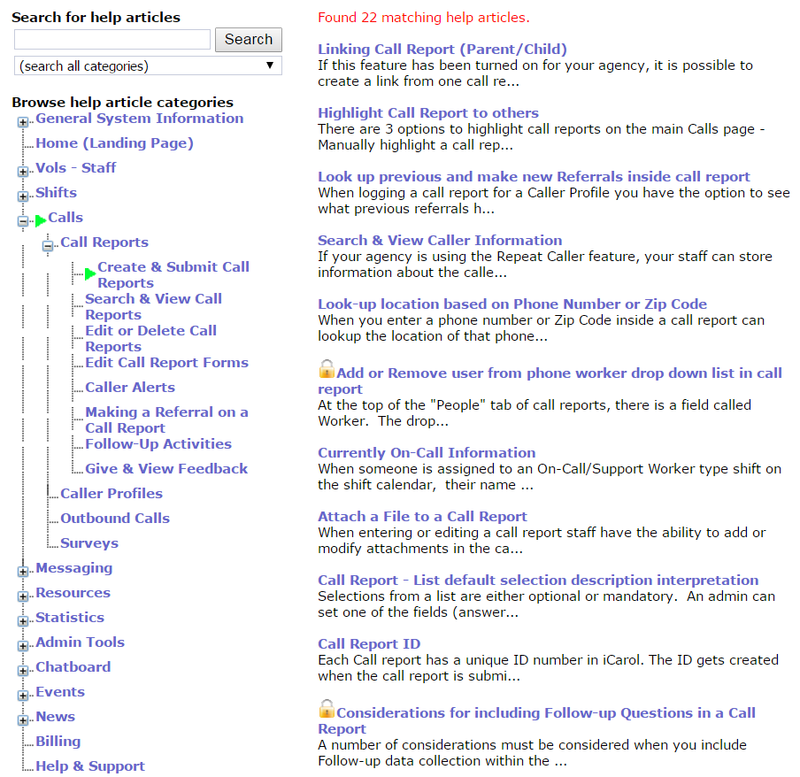 For example, the screenshot below shows the help articles available in the category Calls, sub-category Call Reports – Create & Submit Call Reports. iCarol staff are continually updating and expanding the Help article database as new features, enhancements and updates are released. 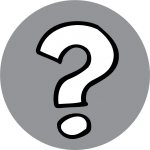 Users with Admin or Supervisor security status can access the iCarol Dashboard, which contains an Announcements, tips and tricks section. To access, simply click Home in the left hand menu when logged into iCarol. This section contains posts about updates, new features, upcoming webinars, and more. Due to space limitations, you will likely only see the latest 3-4 posts displayed. To view earlier posts, scroll down to the bottom of this section and click the link labeled “See all news”. To access the iCarol blog page, access the iCarol website at www.icarol.com, then click Blog at the top of the page. 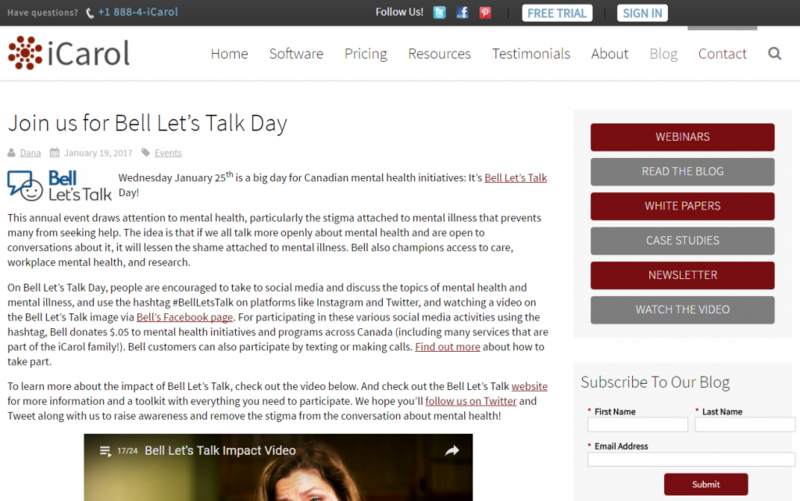 The iCarol Blog contains a variety of articles that pertain to the iCarol software as well as other topics we feel would be of interest to helplines, such as Bell Let’s Talk Day, as shown above. Please note, you can subscribe to the iCarol Blog by filling out the small form you see in the lower right hand corner of the screenshot above. Doing so will deliver a weekly Blog Digest to you via email. 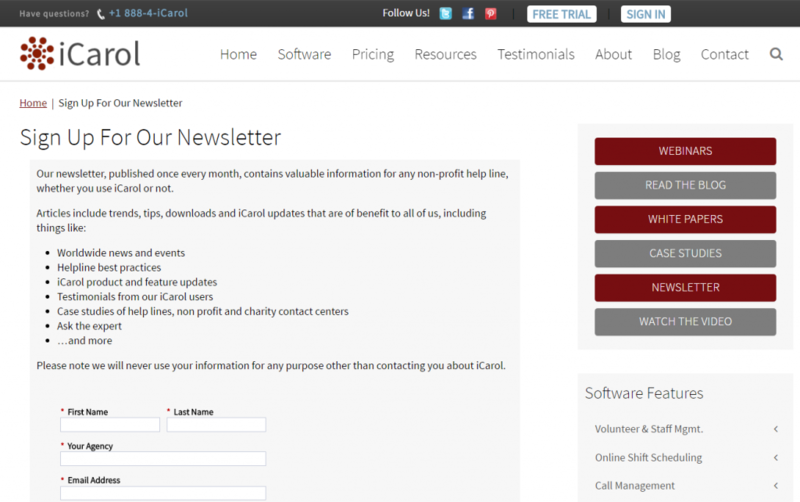 To sign up for the iCarol newsletter, access the iCarol website at www.icarol.com, click Blog at the top of the screen, then click Newsletter along the right hand side of the screen. The newsletter will be delivered to your email inbox. Articles include trends, tips, downloads and iCarol updates, including things like worldwide news and events, helpline best practices, iCarol product and feature updates, testimonials from iCarol users, Case studies of helplines, non-profit and charity contact centers, ask the expert and more. Finally, if you are unable to find the answer to a question you have, you are welcome to submit a case to the iCarol Support Team using the Online Case Management system. This is accessed by clicking Help in the left hand menu when you are logged into iCarol, then, at the top of the screen, clicking “Cases – contact the iCarol Support Team”. It’s almost time for our next Quarterly Enhancement Review Webinar, the first of 2017, which will occur on Monday January 9th at 1pm EDT. In this webinar we’ll review several features released to iCarol in recent months, plus we’ll speak a bit to enhancements coming soon. These webinars are typically most beneficial and interesting to current iCarol clients who are Program Managers or Directors and use iCarol at an Admin or Supervisor security level, or those who are considering subscribing to iCarol. That said, all are welcome to attend. This is part of our commitment to providing excellent communication about iCarol capabilities, updates, and enhancements on a regular basis. We hope you’ll join us! Interested, but can’t make it on the 9th? No worries, we’ll have the recording available on our website shortly after the live broadcast.